Twentynine Palms was an active mining community as early as 1870. In the 1890s a Mr. Aldridge built an adobe house here and and it was used by stage lines running between Amboy and Indio. After decades as a rest stop for wagon travelers on what was called the Utah Trail after a group of Mormons, the town was established in 1920. The post office was established on 28 October 1927. After WWI the government sent veterans who were suffering from lung damage caused by poisonous gas here to recuperate (Dr. Luckie). The climate and clear air worked their wonders - over 90% of them recovered. 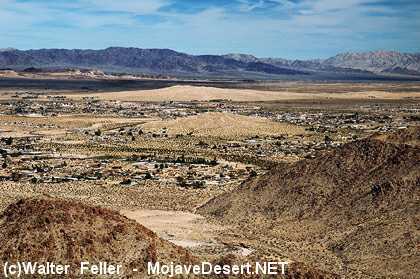 Later the name was changed to Twentynine Palms Springs, then changed back in 1927. In the 1870s and 1880s it was often called Palm City. Also known as 29 Palms. In 1950 the population was 1,022 and in 2000 it was 14,764.